We are Leading Manufacturer and supplier of Brass Wire Annealing Furnaces consist of number of seamless pipe of required grade of steel. Our furnaces are manufactured using high quality materials as per industry standard. The pipes are arranged horizontally at a defined pitch. Each wire uses 1 pipe. The pipe longitudinally the pipe runs in three zones pre-heating, heating & soaking. Pipes are heated through top & bottom heaters designed at 800 °C to 1000 °C. The cracked ammonia gas is supplied in each pipe to get scale free annealing of running wires. Wires are cooled in air-cooling zone before spooling. 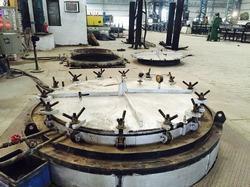 We are Leading Manufacturer and supplier of Wire Annealing Furnaces consist of number of seamless pipe of required grade of steel. Our furnaces are manufactured using high quality materials as per industry standard. The pipes are arranged horizontally at a defined pitch. Each wire uses 1 pipe. The pipe longitudinally the pipe runs in three zones pre-heating, heating & soaking. Pipes are heated through top & bottom heaters designed at 800 °C to 1000 °C. The cracked ammonia gas is supplied in each pipe to get scale free annealing of running wires. 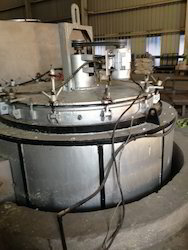 Wires are cooled in air-cooling zone before spooling.